Would you pay $75 for dual mag holder grip? I just order some PLA and ABS plastic material to create more prototypes. Once the design is completed, I may offer these up for sale.. SO, let me know if this is something that you may be interested in. 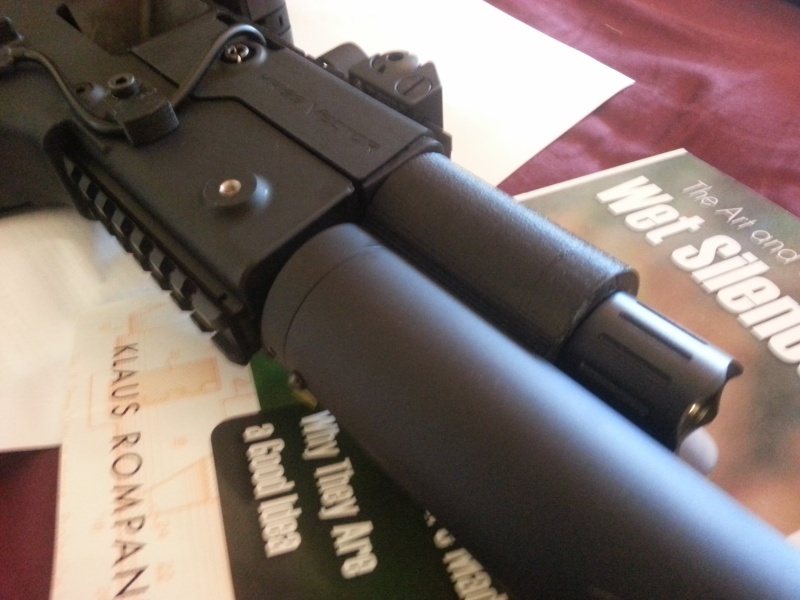 I added new pics to show the black flashlight holder and the Dual Mag Holder Grip V2. 3) Grip detail looks and feels great IMO! 3) Roughness of print in support areas... I printed it on it's side, so one side on the light switch details and grip details are rought die to support material being printed and then removed by me. 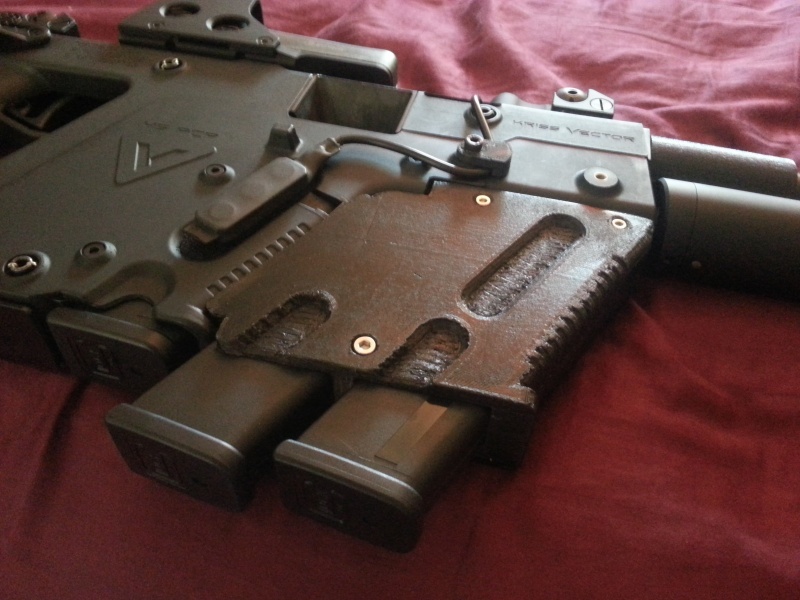 I am going to print it with the picatinny down next time so that support roughness is hidded in picatinny area and are where the grip mates mates with the gun grip. this will allow all cosmetic details to print perfectly. 4) Finish, this prototype was printed in clear plastic and painted semi-gloss. Future ones will be printed in black ABS... I may experiment with sanding and painting flat black. Looks good, how does it perform? Cool mods. What brand of ammo is that? Does sound pretty good considering today's climate. Very nice! I'm definitely interested in the dual mag holder, let me know when you get it smoothed out, I'll take two, one for the carbine and one for SDP! Will the parts be dyed or colored black? Indysbr wrote: Looks good, how does it perform? 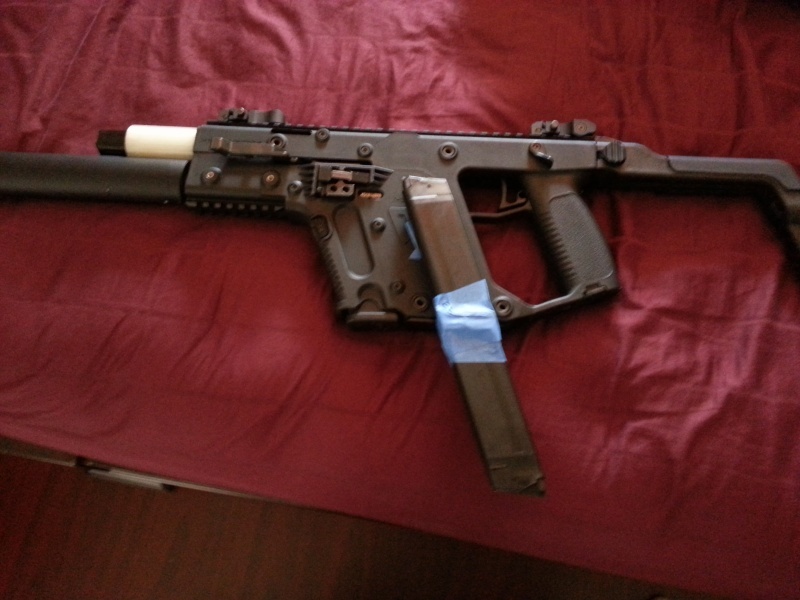 I'm not sure yet, I will probably test it tomorrow if I can get the other side of the picatinny done. I can tell you that just holding it with the forgrip 4" forward seems to make a world of difference in how stable it feels. I like Shoot Straight.. .AC is def. nice.. I will be on the lookout for a fellow Kriss owner next time I go. If you see me over there with my modded Kriss, stop by and say hi. MC BEAST wrote: Very nice! I'm definitely interested in the dual mag holder, let me know when you get it smoothed out, I'll take two, one for the carbine and one for SDP! Nice.. I am going ot finalize the design and if there is enough interest, I may make my own mold and use fiber reinforced polymer for the material. I have been waiting for an excuse to do that anyway. MadDogDan wrote: Will the parts be dyed or colored black? I just ordered black PLA and ABS plastic for my 3D printer, so I can make them in black (or any other color if you want to get fancy) but my goal is to use fiber reinforced polymer that is dyed to match the Kriss exactly. If I only get a couple of people wanting it and it isn't worth making a mold, I can print the part in black plastic but you can see .2mm lines when I do it this way and it comes out a littly shiny. But, you can sand plastic and paint it, so you could do whatever you want and it should come out pretty good. After you work out a price, I'll buy one for my CRB. Thanks.. Yea it just came to me one evening. I saw the sons of guns edition and I really didn't like the mag holder attached to the stock and I don't like the existing front grip location... so that is what led me to the design. I was struggling with the mag detent method.. the prototype is a snug slip fit but I need something that makes more sense for the long run. I wanted to use threaded ball plungers but I don't want to have then sticking up where your fingers will be on the front grip. So, I decided to split the piece in between the two mags about 2 inches up into the center of the holder and put a recessed screw at the bottom for adjustment.. so esentially you can tighten the screw to adjust the "squeeze" on the mags... this should work well I hope. All those are great ideas. 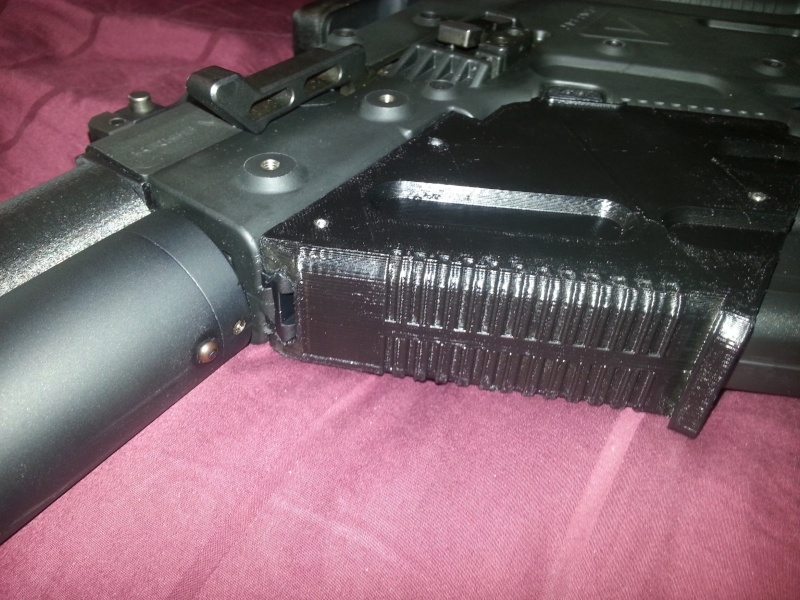 Have you thought about a dual mag coupler that would connect 2 25 rd mags, on the lower sections, "side by side" so that one could switch over mags real quick? Like the several designs for AR mags. Your front rail design is nice but some of us may use the front rail for other purposes. With the spare on the right side one couldn't fold the stock but when shooting I imagine most would be using the stock. Are you talking about something like this? Don't laught at my faux 25rd mag.. I can't find one to buy. This location on the kriss seems to be the only logical place to store extra 25rd mags (one on each side...) If this is what you were talking about, which option do you like for attaching it to the gun; 1) Using the two screws that hold the lower housing assembly in place or 2) Using the 3 push pins that are nearest to that area 2 at the bottom and 1 at the top? I guess I like the 2nd option, but I need to find longer pins and make sure of standard lengths I can get..
Let me know.. 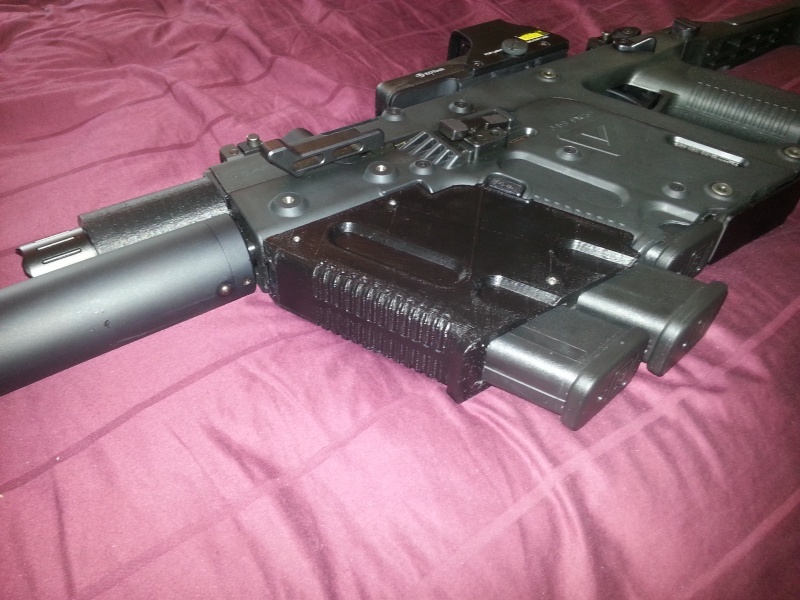 This should be no problem to create..
No, what I like is a coupler that joins 2 mags together, not an attachent to the firearm like a Redi-Mag to which the mag would be held. Pretty common for AR mags. I may have found what I was looking for in these. Ruger BX-25 mags have practially the same dimensions as the bottom half of the Kriss extensions. Only concern would be if the magazine catch can support the extra weight. 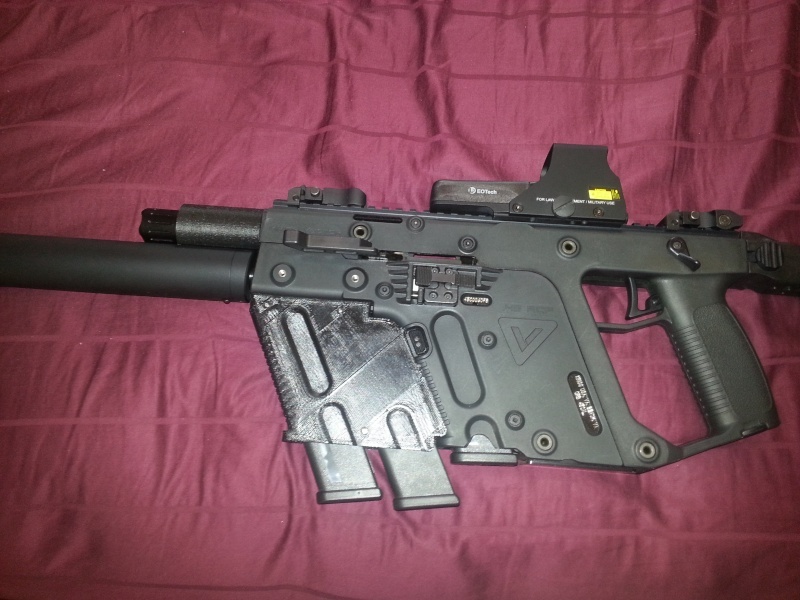 I'll order one of these couplers (I already have BX-25 mags) to see how they would work on the Kriss extensions. oh, ok.. well let me know. I could make those pretty easily. But, does think the side mag holders is a good idea?? I could hold the regular or extended mags. cafox wrote: oh, ok.. well let me know. I could make those pretty easily. But, does think the side mag holders is a good idea?? I could hold the regular or extended mags. I think you could give it a try to see how it would work out. Very interesting. What kind of 3d printer are you using? fused deposition? The ones with the spool of plastic filament? Most of the information I find and collect about the Kriss is documented on my facebook page. It works well.. you can definitely see the .2mm layers in the finished product, but I could send a design to shapeways and have them print it with a better method that would produce a more desirable finish. But, the M2 is great for printing prototypes and test fitting..
Im curious how well FDM 3D printing can hold up. I don't know how strong the material is. I suspect it isn't that strong. Compared to Shaoeways' White Strong Flexible SLA process. I would think shapeways method is more durable.. The stuff I have printed so far seems pretty durable also, but if you go below 1mm wall thickness it seems brittle. But, I could not see breaking the flashlight adapter or dual mag holder grip.. they are pretty solid. Do you think that material could be strong enough as magazine floor plates? Yes, something the size of a floorplate about 2-3mm thick would be very difficult to break by hand. The parts are stronger in the XY axis than in the Z axis because of the layers, so a plate is strong but if you printed an L shape, then one side would be brittle if less than 3mm thick if that makes sense. I just finished printing the Cadet2 flashlight holder and cable hold down in black ABS... It turned out very nice IMO. Seems durable, looks fantastic! btw, the Power Cadet 2 is much cheaper that the Kriss Light Kit. Actually, if you buy the adapter from me for $25, light and switch off Amazon for $95 you are looking at only $120 vs. the Kriss setup for $350. The cadet 2 may not be suitable for the SBR model since it extends out about 3". You could also purchase the original powertac cadet (1 battery version) and the Kriss adapter to realize the same savings.. But it won't look as cool IMO. Can anyone guess what the next project will be?? After I finalize the dual mag holder grip, of course. My guess is engraving plates for $100 bills. Am I close?????? I'm thinking dedicated no modification required CRB supressor made from aluminum infused polymer. 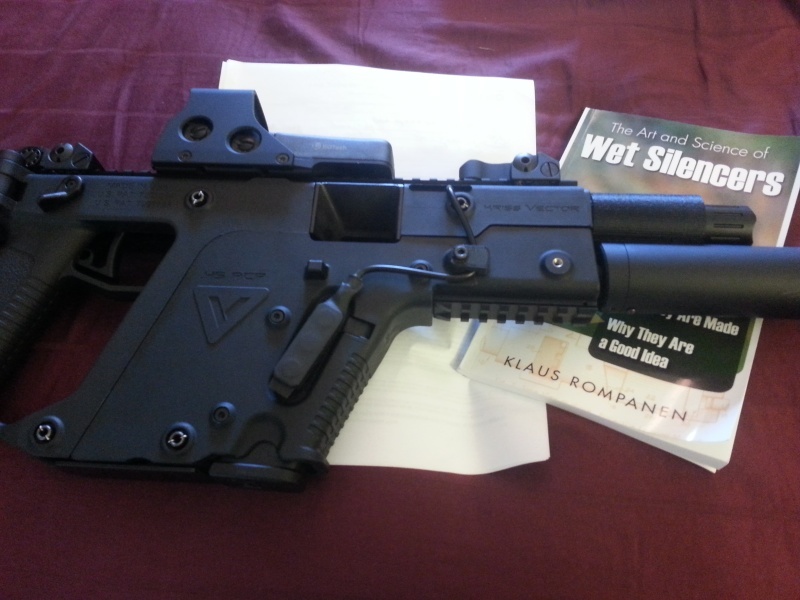 ATF Form 1 to follow... don't be nervous, and I said supressor, not silencer even though the author of this book pokes fun at people that make the distinction between the two. What would a bolt on, no modification required, CRB supressor be valued at? And how the hell could I sell one to somebody?